Not only is this dish often served at barbecues and family gatherings, you can also often find them at little street food stands around Mexico. I especially love to pair this side dish with tacos de rib eye and my Mexican chimichurri-marinated flank steak. A note for my gluten-free friends: Salsa Maggi contains wheat gluten, wheat and wheat bran among its ingredients. A suitable alternative for you to be able to enjoy this dish is Kikkoman’s gluten-free soy sauce. This classic side dish is a staple at any Mexican barbecue. Once you've removed the onions from the grill, put them on a plate or in a bowl and squeeze the desired amount of lime juice over them. Add desired amount of Maggi or soy sauce over the top and let the onions sit in the juices for a few minutes. Pick up by the stems and eat the bulbs. I adore cebollitas. I had some last week after a carne asada to celebrate my friends’ graduation. They were delicious. Love cebollitas, too! First time I ate them was in Guatemala and fell for them. Ana, I didn’t know they pour Maggi on rice in El Salvador! Actually, I have seen a family member or two do it in Mexico, but never in a restaurant there. I’ve also seen lots of people put it in a broth soup with rice and using lime and Maggi to season it. I’ll have to give it a try. It is just so unfair that you cam make your pictures look better than anything Ive ever attempted to cook! Lol! So I’m wondering, excuse my ignorance but where or how do you make salsa maggi? Haha, Jennifer, it’s ALL about the lighting when it comes to photos! Everything is photographed in my own kitchen on the dishes we eat off of, and with no fancy faux lighting. I wouldn’t have the first clue about how to make my own salsa maggi, but you should be able to find it at any Latino grocery store or even in most non-Latino stores if they have at least a Latino foods aisle. If all else fails, you can always purchase online! 🙂 I know MexGrocer.com carries Maggi as well as some other Latin grocery sites. Nice! Do you create the recipes as you go? Hi Mercedes, thanks for the great question! Some of the recipes here come direct from relatives in Mexico; some are versions of recipes from relatives that I’ve adapted to our liking at home (i.e. leaving things out, adding ingredients, changing the cooking method, etc). When a family recipe has never been written down and no one is quite sure exactly how to make it but they at least know the ingredients, I experiment in my kitchen until I get it right. Sometimes I get second and third-hand recipe info passed along from aunts in Mexico. Hmmm… me encantan las cebollitas asadas! Perfect on a hot day with tacos de carne asada and a cold beer. I love that you call him your viejo 🙂 What can I say? Carne asada and cebollitas go together like peanut butter and jelly! 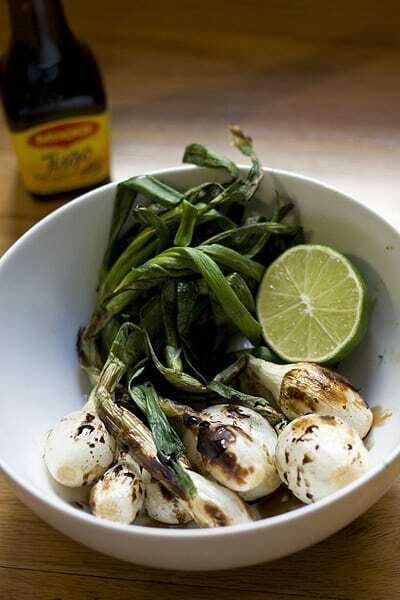 Mmmmmmm….. Cebollitas! They go with everything… even hot dogs wrapped in bacon. Can’t go wrong having cebollitas and [fill in the blank]. But they’re even fantastic just by themselves. Thanks for this great post, Maura. Great post. Here in Northern Sonora, we wouldn’t dream of carne asada sin cebollitas. Hot dogs wrapped in bacon are called “momias” or mummies. Love this photo Maura – so simple and elegant. And LOVE Cebollitas of course. They are the perfect complement to anything off the grill. Mmmmm!